Minneapolis, May 6, 2013–After a win at the last Best in the Desert Race, The Mint 400, Holz Coastal Racing’s Scott Kiger and Mark Holz in their No. 1934 RZR XP 900 would line up for the Canidae Tap It Silver State 300 with hopes to make it two in a row and their second Silver State 300 win. When the dust settled, they would not disappoint. 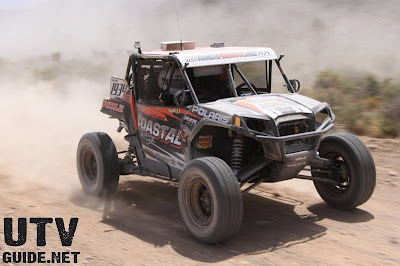 With Cognito Powersports and their RZR XP 4 900 getting the nod to start first, the teams would have to work hard through the typical high-speed, dusty conditions to overtake the leader. Coastal Racing would start right after Brandon Schueler’s Jagged X No. 1919 RZR XP 4 900 setting up a speed dual to take over the lead. With Kiger driving the morning half, he would pass Schueler and all but one of the remaining cars that started in front of him, Cognito. Holz would take over for the second half of the race and suffer a couple flats moving him back to third, and putting the No. 1919 in second behind Cognito. With Cognito sitting with a 7-minute lead and Jagged X and Coastal running neck-and-neck, Cognito would suffer a clutch failure ending their reign and setting up an exciting finish between Jagged X and Coastal Racing. In the last miles of the race, Holz in the Coastal car would make his move finish first with Schueler in the No. 1919 finishing second. The next Best in the Desert Race is the General Tire Vegas to Reno, August 15-17. Jagged X is sponsored by Polaris. Walker Evans Shocks, Pure Polaris Lubricants, CR Designs, Simpson Safety, OMF Performance, Muzzy’s, Kroyer Racing Engines,Vision X lighting, Mountain States Contracting, and UTV Underground. Coastal Racing is sponsored by Coastal Drilling, Holz Racing, Polaris, Walker Evans Racing, Kroyer Racing Engines, Utendorfer Design, BF Goodrich tires. About Polaris Polaris is a recognized leader in the powersports industry with annual 2012 sales of $3.2 billion. Polaris designs, engineers, manufactures and markets innovative, high quality off-road vehicles, including all-terrain vehicles (ATVs) and the Polaris RANGER® and RZR® side-by-side vehicles, snowmobiles, motorcycles and on-road electric/hybrid powered vehicles. Polaris Industries Inc. trades on the New York Stock Exchange under the symbol “PII”, and the Company is included in the S&P Mid-Cap 400 stock price index. Information about the complete line of Polaris products, apparel and vehicle accessories are available from authorized Polaris dealers or anytime at www.polaris.com.